Note: This is the first of a two-part series on fighting corrosion. The second installment will publish Monday. 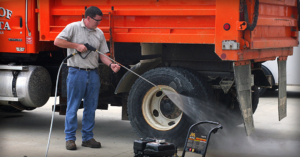 Road salts and deicers are designed to keep roads passable in harsh winter conditions, but left untended the chemical formulas that eat away at snow and ice do the same thing to truck chassis, metal components and wiring. Phillips Executive Director of Innovation Gerry Mead says fleet truck wash programs are often the first things eliminated during cost-cutting exercises, but PPG Commercial Transit Brand Manager Scott Colvin says one of the best corrosion inhibitors is simply keeping the truck clean. However, it’s not as simple as hosing off the rig. Story by Jason Cannon / www.ccjdigital.com.